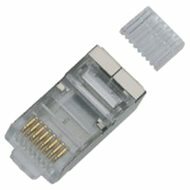 The precision RJ-45 crimp connector for gigabit network cables with gold-plated contacts is especially suitable for cable type wire. It is specially designed for a shielded Category 6 cable. It requires special pliers to fit it. 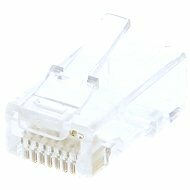 For shipping to other EU countries visit this page 10-pack OEM, RJ45, CAT6, STP, 8p8c, stacked on wire. 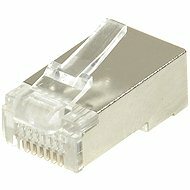 Für Versand nach Deutschland, besuchen Sie bitte 10-pack OEM, RJ45, CAT6, STP, 8p8c, gestapelt, Draht. Chcete doručit zboží do Česka? 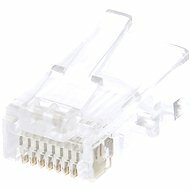 Prohlédněte si ROLINE 10-pack OEM, RJ45, CAT6, STP, 8p8c, skládaný, na drát. Chcete doručiť tovar na Slovensko? 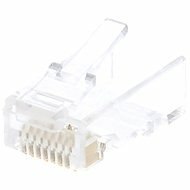 Prezrite si ROLINE 10-pack OEM, RJ45, CAT6, STP, 8p8c, skladaný, pre drôt. 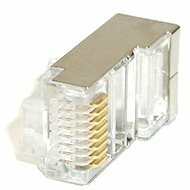 Für Versand nach Österreich, besuchen Sie bitte 10-pack OEM, RJ45, CAT6, STP, 8p8c, gestapelt, Draht. Magyarországra történő kiszállításért tekintse meg ezt a termékoldalt: ROLINE 10-pack OEM, RJ45, CAT6, STP, 8p8c, tömör vezetékhez.